There was no way I could have taken on a project of this size and scope without my amazing community of local artists to help me make this idea a reality. In his uniquely subversive style, Deladeso has repurposed a selection of traditionally “corporate” public walls in a selection of the busiest intersections in Los Angeles (which include Sunset and Highland in Hollywood, Figueroa and MLK in Downtown LA next to Banc of California Stadium, Runyon Canyon in the Hollywood Hills, and Lincoln and Venice in Del Mar, with other locations popping up in LA over the next month), and painted them with a distinctive, iconic camouflage pattern. Emblazoned upon each of these camouflage patterns is a simple statement written in white, which reads “_____ is Hiding in Plain Sight,” with the text revealing exactly what is hiding in plain sight playfully hidden behind the camouflage pattern itself. An installation of this size and scale marks Deladeso’s most ambitious project to date. Deladeso is fluent in multiple forms of media, with past work including projects that range from digital video to illustrations, to collaborations, to merchandise, to physical installations—prior collaborations include music videos by Getter and Randall Kirk II, branded campaigns with brands friendly to experiential content like Pabst Blue Ribbon, Samsung, and General Mills’ Fruit Gushers in collaboration with Slushcult. Artists have praised Deladeso’s unique “grime style” of retouching pop art images with colorful and whimsical accents of colorful animated grime, which, according to Richie, is inspired by “the grime of the city” that defined much of his experience growing up in Riverside, CA. “______ is Hiding in Plain Sight” brings Deladeso full circle, as each mural wall provides him an opportunity to comment directly on the surfaces that inspired him as a child. In the spirit of this community, Deladeso invites you to be a part of this project. Take a photo in front of one of the walls mentioned above and post to Instagram with the hashtag #PLAINSIGHT—or, search and comment on those already posted on Instagram and contribute to the conversation. Let’s not let those around us get distracted by digital diversions. What do you think is hiding in plain sight? For a list of mural locations, please visit Deladeso’s blog here. Richie Velazquez is the mastermind behind the trail of digital death and grime left behind by Deladeso. Richie’s work, which ranges from video, design, illustrations, collaborations, merchandise, and large-scale physical art installations, is inspired by “the grime of the city” that defined much of Richie’s experience growing up in Riverside, California. 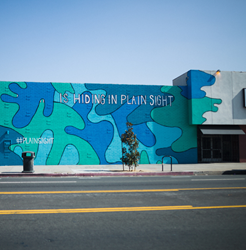 Deladeso’s most recent installation, “_____ is Hiding in Plain Sight,” is viewable at a number of the busiest intersections in Los Angeles, including installations in Hollywood, Downtown Los Angeles, Midtown, Mar Vista, and other locations.